These heavy duty oil-free packages provide fast evacuation to the 10 -5 Torr range. Starting ion pumps in the low 10 -5 Torr range extends cathode life. of the turbo and results in lower base pressure. These packages eliminate the possibility of oil contaminating the cryopump charcoal array while pumping during regeneration. Designed for pumping chamber volumes up to 60 liters. These heavy duty pump packages provide reliable oil-free pumping from atmospheric pressure to the 10 -5 Torr range. Operation is fully automatic and interlocked, and these packages are not adversely affected by operator error or power failure. 3-stage diaphragm pump and 16 cfm molecular drag pump. Separate control module. Pumps to the 10 -5 Torr range. oil-free roughing system for user installation. Includes a 16 cfm molecular drag pump, heavy duty diaphragm pump, power supply and pressure switch assembly, and all vacuum fittings and cables. Mechanical installation takes approximately 10 minutes, and electrical hookup about five minutes. Pumps to the 10 -5 Torr range. oil-free roughing system for user installation. 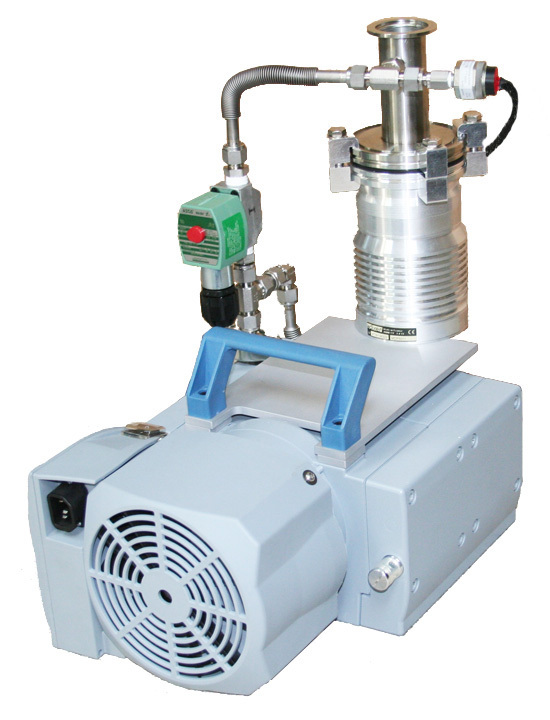 Includes a 16 cfm molecular drag pump, heavy duty scroll pump, power supply and pressure switch assembly, and all vacuum fittings and cables. Mechanical installation takes approximately 10 minutes, and electrical hookup about five minutes. Pumps to the 10 -6 Torr range. for producing vacuum levels to the 10 -7 range in small chambers. The TURBO 60G is a compact, air cooled, portable turbo pump package. This fully integrated 35 lb. package includes a 60 L/SEC hybrid turbo molecular pump, an oil-free backing pump, automatic valving, and a control module. Operation is automatic and interlocked, and the TURBO 60G is not adversely affected by operator error or power failure. Our H SERIES diaphragm pumps provide reliable oil-free pumping to 4 Torr (H-60) and 1.5 Torr (H-200). The H-60 is widely used in the medical research applications such as gel drying and micro centrifuges. The H-200, with a pumping speed of 2.8 cfm, is used in a variety of applications. The H-60 is a two stage air-cooled oil-free diaphragm pump. Ultimate pressure is 4 Torr, and pumping speed is 0.8 cfm. Inlet is customer choice of 3/8" OD stainless tube or NW-16 inlet connection. 115 VAC. The H-200 is a two stage air-cooled oil-free diaphragm pump. Ultimate pressure is 1.5 Torr, and pumping speed is 2.8 cfm (80 L/min). Inlet is an NW-16 flange. 115 VAC. Free evaluation of pumps. Fast turn around of repairs. Fast turn around of pump. Drivac ships repaired drag 2 day after receiving pump. Replace upper and lower bearing clean and test. All of our repairs include a full 12 month warranty on parts and labor. What We Offer We offer three levels of support for our own and other manufacturers' oil-free pump packages. All of our repairs or exchanges include a full 12 month warranty on parts and labor.